The <mark> tag is used to highlight the content. The <mark> tag generally used for highlight the relevant content in a context. The <mark> tag will also support both Global Attribute and Event attribute. <mark> tag belongs to Flow content, Palpable content and Phrasing content category. HTML 4 does not support <mark> tag. <mark> tag new in HTML5. 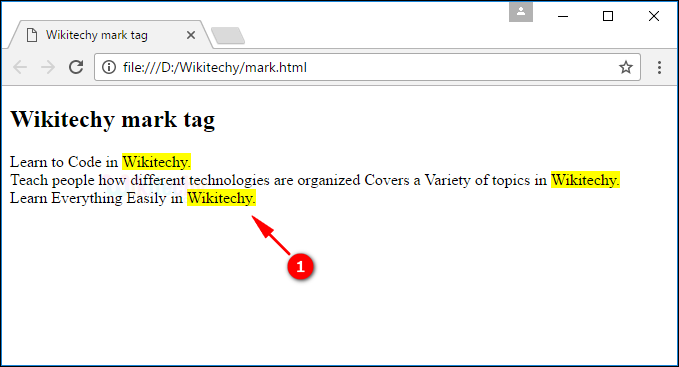 <mark> tag is used to highlight the wikitechy word in the document. Here we can see the highlighted text “Wikitechy” which is given within the <mark> tag.